A 1916 advertisement says that the best place to eat after 2AM is the Chinese restaurant in Gleichen. Hick’s Trading Company had a huge sale flyer in the January 27th, 1916 Gleichen Call. January 13th 1916 there is an add for the Ford Dealership in Gleichen owned by W.R.Mckie. 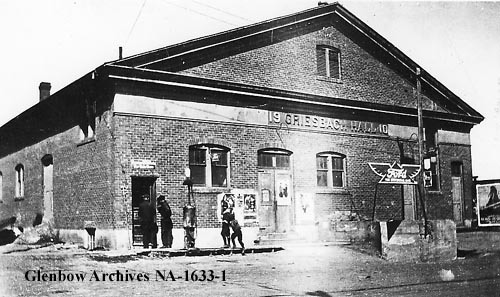 Emile Greisbach open a Opera house in 1910 which burned down in 1921.
have you any records of a Dr J W Giffen or of George Evans Funeral Director in the 1950s. I am trying to find any records of my grandfather Alexander Grant who lived in Gleichen from the late 30s till his death in June 1950. I don’t have any of the records for either of those people but was your grandfather buried in the Gleichen cemetery? If so I can see if I can find his headstone and any info from it. I’ll also ask some of the people who lived in town back then. The info isn’t available online but if your ever in Calgary they allow people to access records but you need to call them first.